The project „Tandem“, which was developed by the European Cultural Foundation and MitOst and is carried out together with Centre for Cultural Management Lviv, Soros Foundation-Moldova and Culture Action Europe, is aimed at building new and long-term collaborative relations between select organizations from European Union countries and cultural key players from Ukraine and the Republic of Moldova. Selected institutions will send one cultural manager each, who will form a tandem with a partner from the Republic of Moldova. 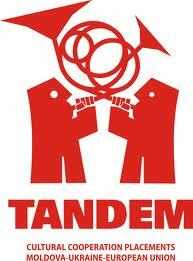 Each tandem has the task to plan a joint entry to the concluding festival. Mutual fourteen-day working visits to partner organizations offer participants the opportunity to familiarize themselves with the environment and cultural practice of organizations in the partner country and get an insight into the cultural scene of the tandem partner’s city, region and country. The working visits will be completed by joint workshops and evaluation meetings attended by all project participants, creating an opportunity for exchange with other people, in addition to the tandems. The project will end with a festival each in the Republic of Moldova in May 2012. To enhance awareness and understanding of creative values already shared across the EU, Ukrainian and Moldova while simultaneously promoting innovation of artistic expressions through a fruitful combination of local cultural particularities on trans-national cooperation levels. To increase and consolidate the number of tangible, influential and long-lasting direct artistic cooperation links between pioneering cultural organizations from across the EU countries on one hand and Moldova and Ukraine on the other. To mutually increase readiness, flexibility and capacities of cultural organizations in the EU, Moldova and Ukraine required for engaging in productive trans-national cooperation projects on pan-European level which ultimately result in new creative long-term partnership on equal footing. 100 artists from the EU, Ukraine and Moldova directly involved in artistic projects produced by the new working “tandems” for programming a European Week of Arts & Culture in Moldova and Ukraine. Increased visibility for and awareness of importance and practice of creating new innovative trans-national cultural cooperation channels between the EU Moldova and Ukraine. Increased level of theoretical and practical knowledge on intercultural understanding and trans-national collaboration facilitated by training workshops, study/working visits and exchange for a representative number of key multipliers from EU, Moldova and Ukraine. The Euro-Ukrainian/Moldova project consortium realizing the proposed action gains valuable insights to the practical realities of organizing such large-scale trans-national exchange processes and becomes a knowledge pool for innovative mobility of arts and culture practice between the EU, Moldova and Ukraine. The overall operational framework proposed for the action becomes a reference project for similar actions of other public and private stakeholders the European field. Fourteen-day working visit of Moldovan participants to the EU; at the beginning and the end of their stay, all participants will attend joint meetings and workshops in Brussels (September 2011). Ten-day working visit of participants from EU member countries to Moldova, with joint workshops marking the beginning and end of the stay to be held in Chisinau (February 2012).